Elena Stancanelli was born in Florence and lives in Rome. 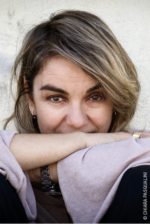 She is the author of Benzina (1998), which became a film directed by Monica Stambrini in 2001, Le attrici (2001), Un uomo giusto (2011) and La femmina nuda (2016, finalist for Premio Strega, Premio Ninfa Galatea, Premio Caccuri). Among the other works, the short stories Il giorno del mio compleanno included in the anthology Ragazze che dovresti conoscere (2004), Cappelli, included in the anthology Figuracce (2014), and 6-0 6-0, included in Smash (2016).